Knoxville, Tennessee (CNN) -- Helen Ashe experienced many hardships growing up in Abbeville, South Carolina, during the 1930s and '40s. Her family's first house had no lights or running water. "We have so many people that are in need," said Ashe, 83. "That's what keeps us going." The Love Kitchen prepares and distributes about 2,000 meals a week from a large community center that's equipped with a restaurant-style kitchen. On Wednesdays and Thursdays, the Love Kitchen serves a lunchtime meal where everyone is welcome. Hundreds often dine in, but the majority of meals -- 1,500 on average -- are delivered to Knoxville residents who cannot physically leave their homes. Many of these people are elderly and suffer from debilitating illnesses or diseases. "Each week, we get a list of people that are either hospitalized, too old to come in to eat, or homebound," volunteer James O'Hare said. "Then on Thursday, they take a stack of these seven meals, and the volunteers deliver to that person." Each takeout box has an entrée, a vegetable, bread and dessert so recipients receive well-rounded meals for a whole week. But they also get much more. "It feeds their body, and it also feeds their soul," O'Hare said. "They have somebody that comes and talks to them, gives them some encouragement." Ashe doesn't typically deliver the meals herself. She and her sister stay at the community center, greeting volunteers, recipients and even fans who drop by to say hello. "My sister Ellen is a blessing to me," Ashe said. "She always says the Love Kitchen was in the making. And that's why the Lord sent two: because it's so much work to do for one." The two enrolled in nursing school in the late '50s, and after graduation, they began working at what is now the University of Tennessee Medical Center. At the time, Ashe said, segregation was in "full force." She saw many of her black patients struggle for food and transportation. "They didn't have money," Ashe said. "They didn't have transportation home. The Lord put it into my brain for me to do something about this." Ashe said she used her own funds when she could to help those in need. However, she dreamed of a place "where people could come and eat and wouldn't have to pay anything." In 1986, that dream became reality when the pastor of a nearby church said she could set up shop in the basement. 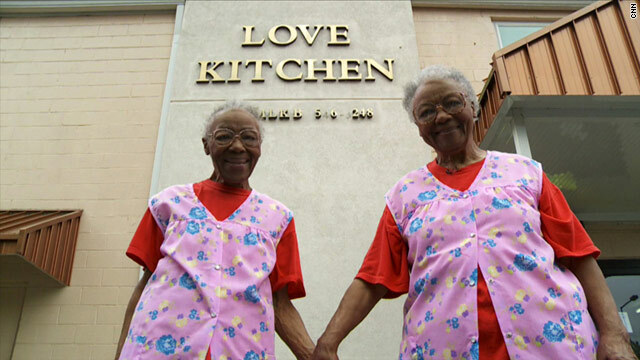 The first day the Love Kitchen opened its doors, it served 22 meals. "I think our first meal was fried chicken with some fried potatoes and a little salad on the side," said Leroy Mundy, 66, who has been coming to the Love Kitchen since it started. The number of recipients grew over time, as did the venue size. But more than two decades later, there's still down-home Southern cooking and some good old-fashioned Southern hospitality. "You leave with love and some higher spirits when you talk to these two ladies here," Mundy said. The Love Kitchen's food is donated by an area grocery store. Local farmers and specialty shops also bring in fresh vegetables, fruit and baked goods. Meals are served fresh in a kitchen that is up to Health Department standards. Volunteers range in age, and many are local professionals who have been inspired by Ashe's vision and work. Ashe gives all the credit to God and her wonderful parents. Her motto remains the same as the day they opened their doors. "We work for what we got, and we share what we get," she said. Want to get involved? Check out the Love Kitchen's website at www.thelovekitchen.org and see how to help.